The CCE has, over its years of service, assisted with thousands of consultations. 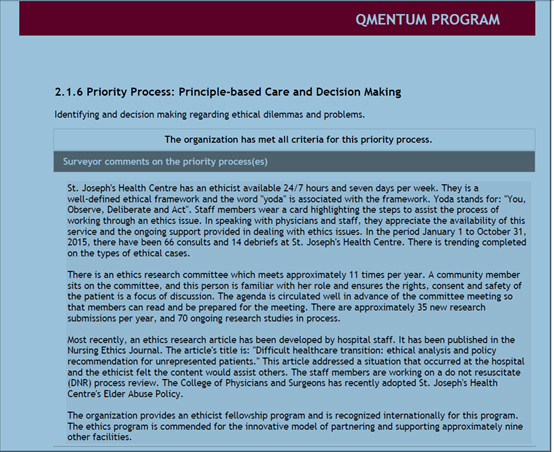 For example, in 2013 the CCE provided 607 consultations on clinical and organizational ethics issues. With this degree of activity, we are likely the most widely used ethics service in Canada. We offer 24/7 ethics service coverage. The CCE has a great deal of expertise in aiding with end-of-life decision-making. Attendance at unit rounds/huddles serves the dual purpose of providing visibility to the clinical ethics service and its availability, and building capacity at the team level for the identification and resolution of ethics issues. All members of the CCE team have expertise in huddles and rounding concerning end-of-life issues. CCE members routinely meet with patients, families as well as teams regarding end-of-life decision-making. This is part of CCE’s proven track record of being valued members of the health care team. We have active ethics committees, or ethics integration committees in affiliate hospitals and have experience establishing such ethics committees. The strength of employing such a committee is that it moves beyond the “sole” bioethicist model. It is a development and improvement of the “Hub and Spokes” model by focusing on the education and development of ethics champions. The first step in creating such committees is to identify ethics champions from across the organization and invite them to be members of these committees. Continue to promote and provide education. The CCE provides accreditation preparation in its yearly plans, in collaboration with the appropriate committees and key stakeholders. The CCE has a track record of assisting hospitals to comply with accreditation standards. We have been involved in accreditation at most of the 12 healthcare organizations we provide ethics services to (over 14 years and at multiple sites).